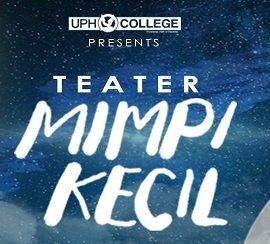 This year, we have chosen “DREAM” as the theme of our theater production, hence the title “MIMPI KECIL”. It tells about how great dreams are always pursued by achieving small dreams along the way without giving up. The theater is run under the guidance of the most renowned theater organization in Indonesia, KATAK Theater and will be held on March 29, 2019, in UPH Grand Chapel, Lippo Village. UPH College was established in 2010 as an Christian educational institution that is committed to being part of the transformation of education in Indonesia. As part of the renowned Yayasan Pendidikan Pelita Harapan, we are a trusted institution where students are prepared to be ready for university, career, and life. At UPH College, we are committed to educating lifelong learners. Our classes are designed to help students grow into well-rounded individuals ready to progress to the university and equipped with the life skills that they need for their future career plans. Every aspect of teaching in our institution is aimed towards building whole and balanced individuals intellectually, spiritually, emotionally, physically, and socially.